For 20 years, I was fortunate to contribute to one of the coolest rod magazines out there, Rodder's Digest. Under the leadership of Gerry Burger, it was a grass roots endeavor that told it like it was, but more than anything spoke to the audience as a group of rodders would speak to each other . . . with LOTS of bustin' chops!!!! Gerry gave me an opportunity to submit to the magazine in the mid 80's and soon asked me to come aboard for each issue after that. Hence, my magazine career began. The best part about drawing for RD was Gerry's insistence that I say whatever I wanted, "as long as you can take the heat!" What a great opportunity it was for me to 'talk' to my audience on a subject that I was passionate about. 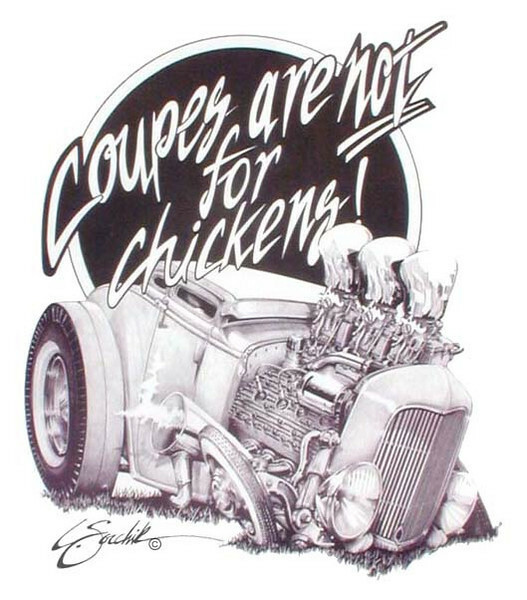 The people my wife Diane and I have met, the friendships we've made and the subsequent illustration jobs I got were largely due to my exposure in Rodder's Digest Magazine. Sampled below are just a few of the many "Here's Where I Draw The Line" cartoon editorials created over those 20 years. Enjoy!